At the opening of her beadworking exhibit, Semenova Polina Ivanova sat at a table and received flowers and accolades from a wide variety of people. 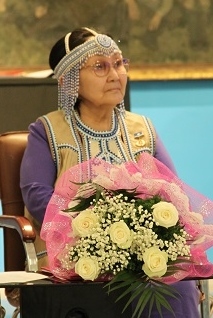 She wore a headdress, necklace, vest and reindeer hide boots, all beaded with traditional Evenki designs. The ceremony also involved performances by local and visiting artists and school children and a fashion show of modern interpretations of traditional beadwork by Ivanova's grandaughter.